Fourth post of the day?!?!?!?!? While hiking, I routinely go over, under, and around many fallen trees. This one, however, foils every attempt. There's really thick brush so going around it is out. It's too high to crawl over. And it's too low to crawl under while wearing my pack. I fight with this stupid tree every time I go hiking. Today, I crawled under and my pack got completely stuck. I wriggled and twisted my way loose and fell right over. Fortunately I was annoyed rather than injured. And fortunately, no one else watched me do what was surely a hilarious series of stunts. On the way back, I took off my pack and crawled under without any problems. I may be slow, but I can be taught. 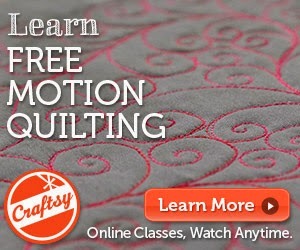 This is supposed to be a quilting blog, right? Someone has fallen in love with Glitter thread from Superior. It might be me. And if you have tricks on how to photograph irridescent thread on black fabric so that it doesn't wash out, I'm all ears. This one was taken with overhead lighting but no flash. The actual quilting is much more vibrant than the photo reveals. This car has been parked in my driveway for 1-1/2 years. We bought it when it was 7 years old. It was my car for many years, and then it was the babe-mobile for my teenaged son. We got a better used car and this one was retired. Good-bye, old friend, I will not mourn thee. And hopefully someone, somewhere, will give you the love you need. SIng along with the Brady Bunch! Wasn't Cindy cute in her little pigtails? Anyway, I worked this morning and got some stuff done before I hit the trail. I was also waiting for it to warm up a bit. I'm not that hearty and 50 is cool in the shade. I knew my hike would be interrupted often by my runny nose. (It was.) I had 2 hours 45 minutes before I had to be a mom, so I went to visit some happy places. They are a bit greener than they were 2-1/2 weeks ago. Next week I hope to audition this place as another happy place. I didn't have enough time to get there and back today (it's another 75 minutes each way), but I'm checking the weather for next week already. I met 5 people hiking today. That's unusually high, but I guess I wasn't the only one who noticed that the sun was shining. The first two men shared my philosophy of hiking. (hint: I go out into the woods to be alone.) When we passed on the trail, there was a quick 'hello', no eye contact, and away we went. I was passed by two trail runners, so they had no time for conversation either. The final young man was probably in high school or college and he stopped to chat. He asked about my trekking poles and I agreed that they were quite handy. He asked where I hiked to and I told him about the lake. He asked if the trail went to the next town over. I laughed and told him that the trail went to Georgia and that if he turned around and went the other way, he'd eventually hit Maine. He looked a little shocked. I sent him to the library to get information on the Appalachian Trail. Today I did my part to educate the next generation. I've known for a year that April would be crazy busy. Crazy busy in a good way, but crazy busy is still crazy busy. It's exceeding all expectations at that. Things should calm down to the normal chaotic roar after Sunday, but I decided that I really, really, really need a day off before I go back to the grindstone. I think I should go hiking. Or get a pedicure. Or have a super sweet sewing day all to myself. Any other suggestions on how to spend a much-needed day off? Or several days off? Please comment. 100% of my recent comments have been spam. I feel so unloved. I drove home from MQX on Sunday. My car was emptier coming home. Next year, hopefully I can get more shopping done. I chatted with some friends and listened to the end of Harry Potter: The Half-Blood Prince to keep me awake. The weather couldn't have been more perfect for a drive through New England. And I'm falling in love with my GPS. People have asked me the route I took, and I can only answer that I go wherever the little voices tell me to go! The show was, as usual, amazing. The quilts were inspirational. The work was fun. I love the people I work with. I taught 5 classes and they were a hoot! I learn so much from my students and I hope to have the opportunity to teach there again. I'm home now, quilting away for customers and putting the finishing touches on a quilt retreat that I'm teaching this weekend. If anyone knows about a lost-and-found from the show, I lost my voice. Think I could get it back before this weekend? Dinner Thursday: butternut squash ravioli and chicken cutlets with pancetta in a frangelica sauce with a taste of cinnamon. yum. Here's to hoping for dinner tonight. I'm enjoying the MQX diet. We don't need no stinkin' SUVs! Today's very short hike was very awesome, but this picture sums up my feelings about doing my taxes. This outhouse is brought to you by the Boy Scouts of America. Thirty short minutes from my house you can have the honor of using this fine facility. OR, hike with your legs crossed for a while and enjoy my hideous harvest gold bathroom -- it may be ugly, but it flushes. I wish I had a camera that captured sound. I was on the top of the mountain and it sounded like a fleet flock herd gaggle lot of helicopters were flying up from the valley. As the noise grew closer and louder, I realized that it was wind. Awesome warm gusts of wind. I also wish I had a camera that could capture smell. We had thunderstorms overnight so there was a damp, sweet, warm smell that shouted spring. Back to my taxes. Yuk. I have a large quantity of stuff to transport for my job this week and it won't fit in my little baby car. Am I no longer green if I lust after a large SUV? It's now time to bore you with hiking photos. It's spring, but not very green yet. I am so incredibly blessed to live here.